After nearly 10 years, home prices are within 6.3 percent of their record high seen in June 2006. We have been here before, but we are in a different environment these days. The labor market has benefited from the longest stretch of private job growth on record, the stock market is at all-time highs, corporate balance sheets have seldom looked this good, we have a more regulated lending environment, consumers are deleveraged, our population has grown and consumers are more cautious this time around. As we near (errr return to) “peak” pricing, there are several important items to bear in mind. First, this is not a brand new high in some foreign land, it is a return to where the market was 10 years ago but with better fundamentals (see above). Second—and as the chart suggests—if you assume that prices had followed their long term trend of increasing at 5.0 percent per year (nominal, not adjusted for inflation) as they have, we are still not back to where we would be assuming that rate of increase over the last 20 years. Third, this market is not fueled by irrational, unjustified speculation and exuberance—a leading cause of bubble-itus. Rather, it is fueled by low interest rates, rising rents, job growth, a diverse and robust local economy and slowly rising incomes. Those who remember paying $0.05 for a cup of coffee or a candy bar like to remind us: prices will rise. It is inevitable. 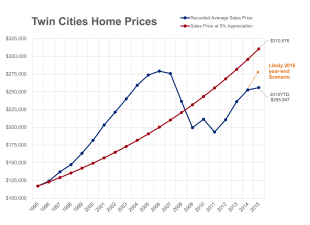 To expect home prices not to follow that trend is unrealistic. Once home prices began recovering, it was only a matter of time before they surpass their previous peak. Given all the improvements we have seen in the market and economy, it is no surprise we are back to where we were. But this time, under much better circumstances.